Superior Storage Solutions is a leading supplier of high quality stage systems which have been professionally designed, developed, tried and tested. A multitude of configurations can be created including performance stages, presentation stages, choir risers, tiered stages, tiered seating and catwalks, etc. The systems are suitable for indoor or outdoor use and a range of accessories and options are available to tailor the staging system to your exact needs. There are many benefits associated with our Alu Rapid stage platforms including our unique and unrivalled lifetime warranty. 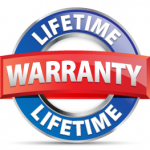 This offers a guarantee and extra peace of mind to the original purchaser of a staging system that our products are free from defects in workmanship and materials. Looking more closely at the physical attributes of our Alu Rapid stage platforms, they are versatile, nice and compact to store, easy to erect and put down, light in weight and extremely strong and robust. 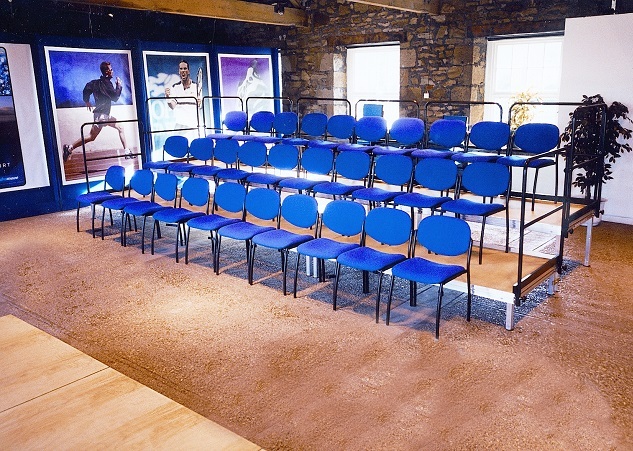 If storage is a key consideration when considering a new stage then you’re in luck. 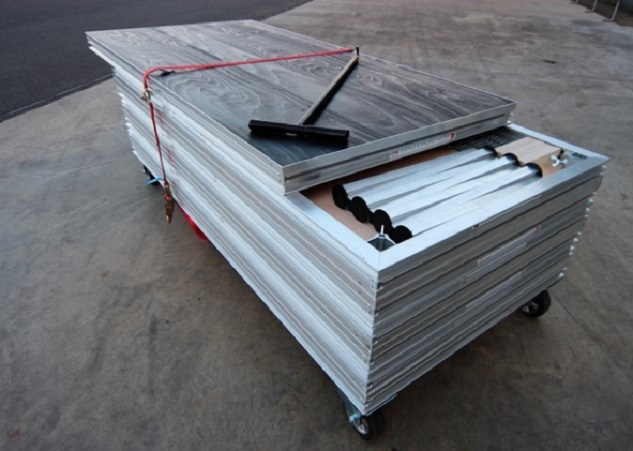 Our Alu Rapid stage platforms have been cleverly designed to store compactly and a complete stage of up to 40m² can be stored in just 2m² of floor space which helps maximise your storage capabilities and is also good from a health and safety point of view. Our best selling platform is easy to use and compact for storage. The height of the stage can be varied by simply changing the aluminium legs. • Alu Rapid V: The Alu Rapid V is virtually the same as the Alu Rapid but includes higher specification leg casting which takes leg sizes of up to 60mm round or square, and can be assembled up to 1680mm without sway bracing. Designed for easy use in primary schools where heavy items such as pianos are not required on stage. It does however, retain the Alu Rapid features of compact storage and durability. 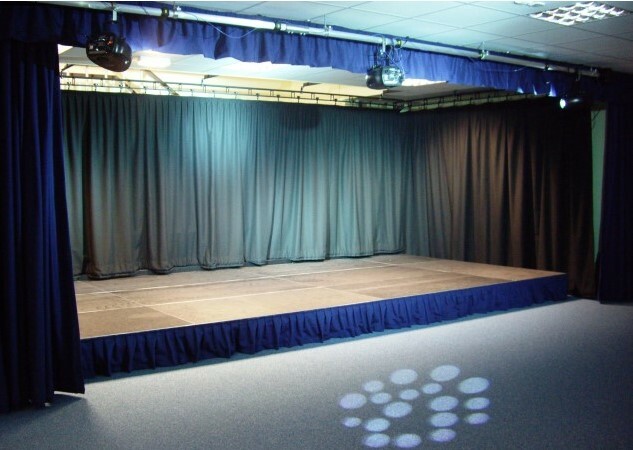 The Alu Compact range consists of a demountable frame and curtain unit and produces a professional, full size stage application. The upper construction consists of multi-chamber profiled aluminium columns and beams which provide an easy-running curtain drawing system. Designed to be totally self supporting, only bolted to the staging edge, the Alu Compact construction provides a complete system for the support of all the main and side curtains together with light hangers and provision for the incorporation of sets, decorations, studding partitions, etc. Both the Alu Rapid or Alu Combi platform can be used with the Alu Compact system. A versatile staging platform with adjustable height by integral scissor action legs which is ideal for applications where a multi-height platform is required without the need for additional parts by using the scissor action legs. 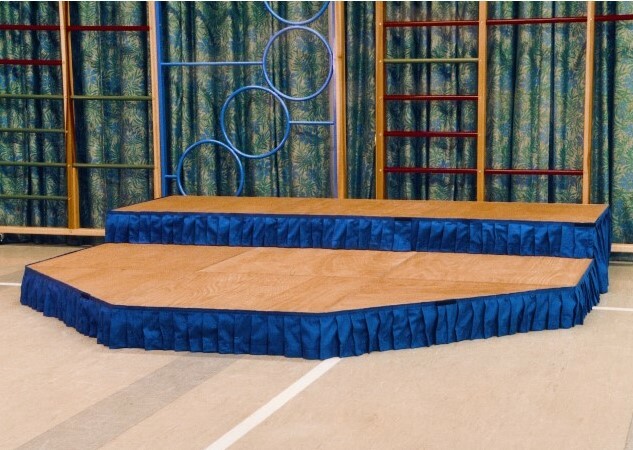 We are pleased to offer a superb range of high quality school stage platforms which have been specifically designed and manufactured with an educational setting in mind. The system was designed for operation in its simplest form and has achieved this with excellent results. A finished Superior Storage Solutions school stage oozes quality, doesn’t rattle from loose tops, suffer from any loose components and is free from trip hazards. They have been built to last and have been subject to a stringent testing programme. 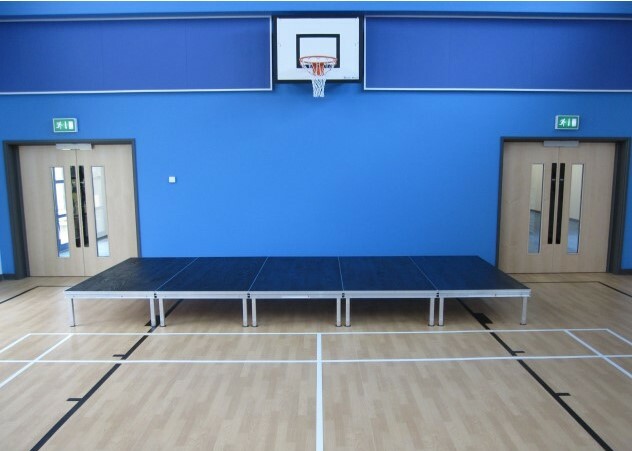 Our school stage platforms have a very professional look and feel to them with securely fastened beech finished decks, which can be polished, tiled or carpeted to achieve your desired finish. The wide range of colour finishes also allows the system to fit in with any colour scheme or style within a school hall. 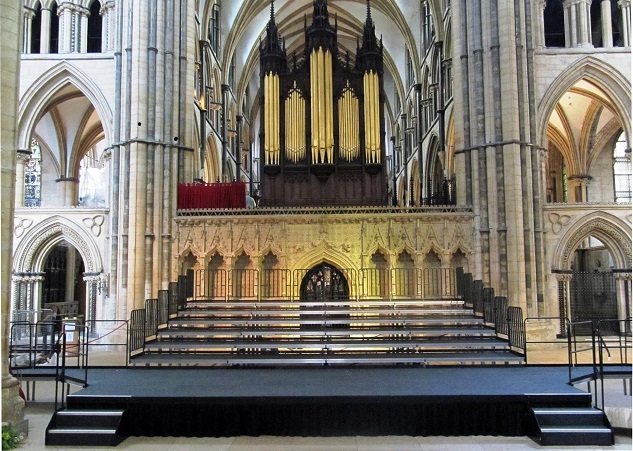 Many accessories are also available to complement the stage and include: steps, valance curtains, back drop curtains, fascia’s, handrails, choir holding borders, storage trolleys, lecterns, sound and light kits, etc. We can fully customise your order to meet your exact needs and specification. 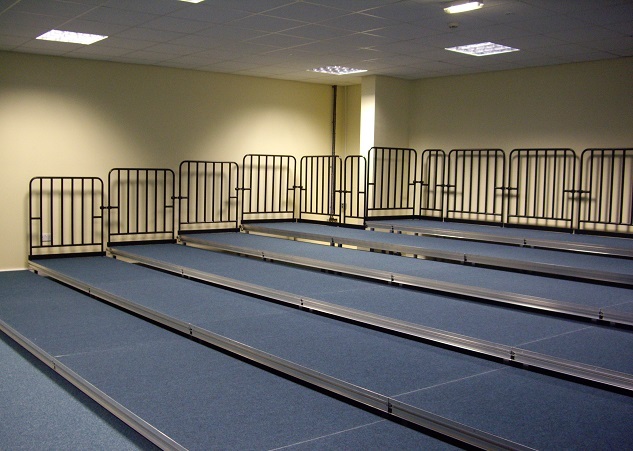 If storage is a key consideration when purchasing a new school stage then you’re in the right place. Our school stage platforms have been cleverly designed to store compactly and a complete stage of up to 40m² can be stored in just 2m² of floor space which helps maximise your storage capabilities and is also good from a health and safety point of view. Superior Storage Solutions is proud to offer a range of high quality school stage packages to suit every budget. 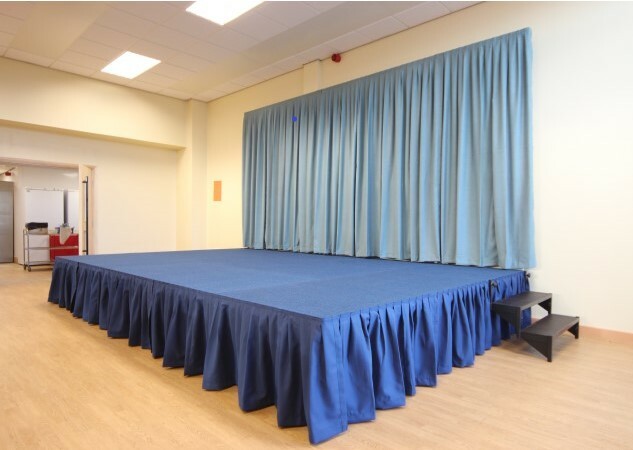 Whether you are looking to use up surplus school budget or planning for your new budget we can provide a stage for every application that will lift the performance of your students. Alu Rapid staging is renowned for its versatility and superior build quality. 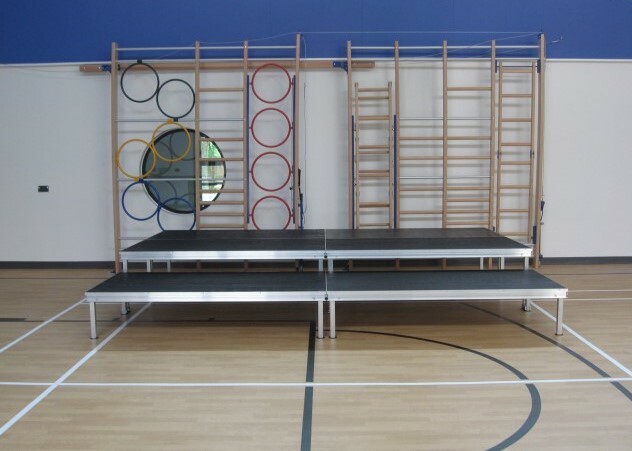 Using our 2m × 1m platform decks is the quickest and most cost-effective method to assemble a stage for your school hall. A multitude of configurations can be achieved with our flexible stage systems. 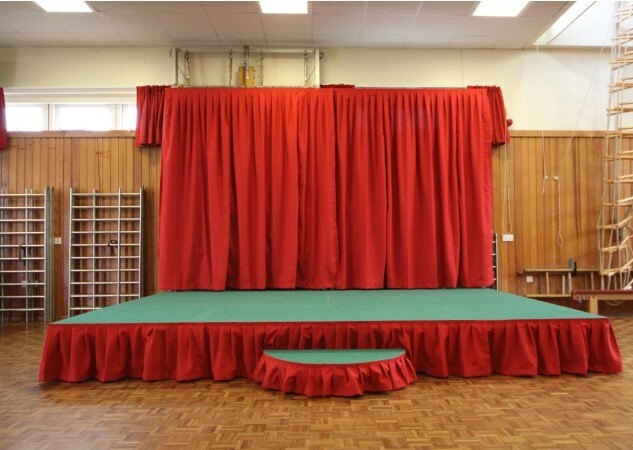 Our school stage packages have been designed with simple storage in mind for those with limited storage capacity. Package prices include a step and a stained wood finish. Lacquered or carpet finishes are available as an additional cost option. Please contact us to discuss your individual requirements to create your own unique staging package. 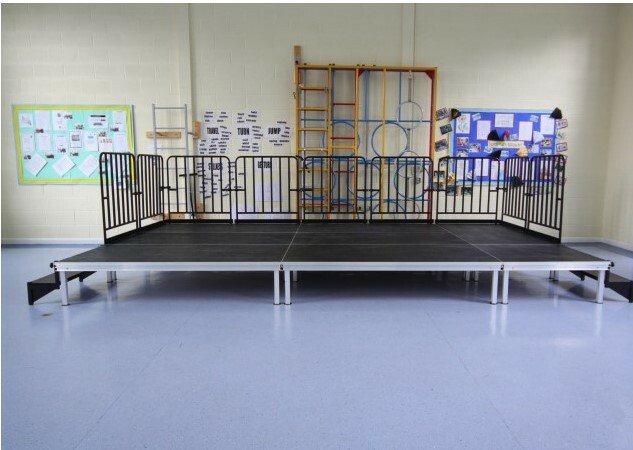 The standard leg height for our school stage packages is 400mm and can be tiered at heights of 200mm and/or 600mm to create a choral riser or a platform for tiered seating. Other heights are available so please let us know your requirements. Please note that our Alu Rapid school staging packages are covered by our unique lifetime warranty to give you extra peace of mind and include free delivery to all ROI addresses. Please get in touch for delivery prices to any off-shore locations. 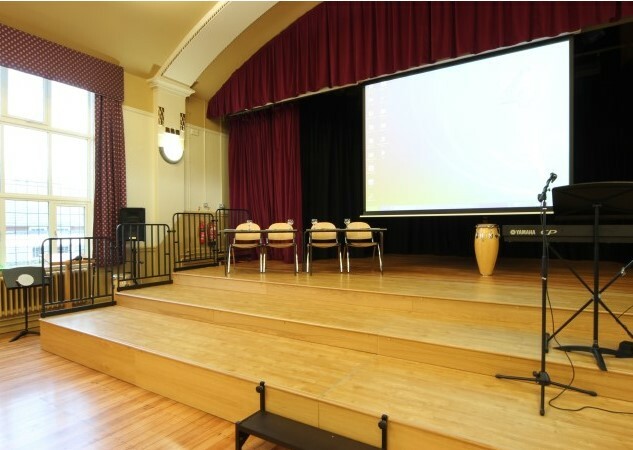 Expert and friendly advice on how to maximise the space in your school hall is just a phone call away. For further information or to arrange a free quote or demonstration, please do not hesitate to contact the Superior Storage Solutions team.